As a longtime fan and admirer of Judd Apatow's work, it's been thoroughly fascinating tracking the swooping arc of the career he's enjoyed in the entertainment industry. First, there was his impressive ascent to fame and acclaim -- as he went from mildly successful stand-up comic to comedy feature kingpin (40-Year-Old Virgin, Knocked Up) by way of a couple short-lived, but respected TV shows (Freaks and Geeks, Undeclared). But even more interesting has been watching what he's done from his comedy catbird seat. After tackling more personal film projects in recent years (Funny People, This Is 40), the maturing storyteller now devotes most of his time and energy to helping launch the next generation of comedic talent -- as the director of the Amy Schumer-led Trainwreck and producer on Lena Dunham's HBO series Girls. 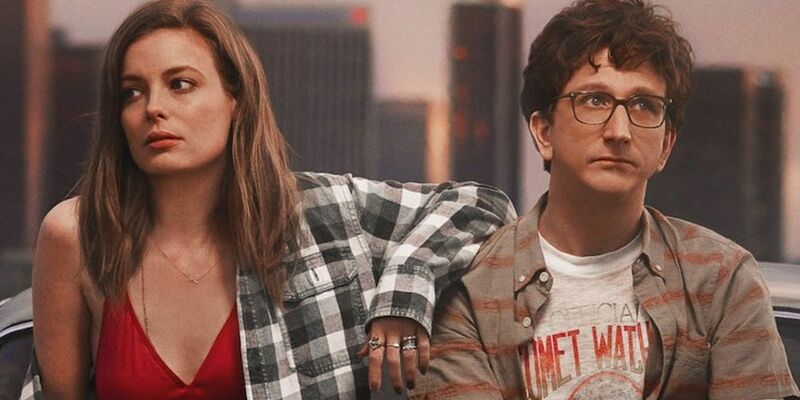 While it may be too early to tell if Paul Rust and Lesley Arfin are notable members of their own comedy generation, their new Netflix series Love (co-created by Apatow) certainly falls in line with Apatow's current career trajectory, as well as his evolving sensibility. Less driven by meticulously crafted jokes, punchy dialogue and wacky sight gags, the humor of Love is wrought from the more realistic and melancholic places of damaged relationships, loneliness and the longing for genuine connection. The show's resulting tone makes for fewer guffaws, but leaves room for honest storytelling, real heart and character growth. And based solely on the series premiere, 'It Begins,' personal growth and how it impacts romantic relationships appear to be what the show is really about. Playing like the first act of an Apatow film, the 40-minute episode is essentially a stage-setter for the first season's remaining nine episodes, which seem bent on closely examining the ensuing relationship between its lead characters Gus (Rust) and Mickey (Gillian Jacobs), and all the highs and lows they experience along the way. While the premiere's structure resembles that of your typical generic Hollywood rom-com in some ways, the series format also gives Love the advantage of patience. Unlike those same run-of-the-mill film features, the show is clearly taking its time in establishing its characters and its world, without having to gloss over the details. Sure, the premiere has a couple of big character-defining moments, like when Mickey shares her guilt for her breakup with Eric (Kyle Kinane) in front of a church congregation (while on Ambien). But the smaller moments -- which would often die on the cutting room floor of a movie -- are just as effective, like Mickey eating cold spaghetti alone, or Gus finally loosening up at a party with neighbors he just met. Ultimately, the patient approach for the series is a smart one, given the show's characters will drive both the story and the comedy. The show's first episode might be light on big laughs, but its greatest achievement is that it gives viewers a real sense of who Gus and Mickey are before they actually meet for the first time. Before the episode has ended, both characters' flaws and their relatable vulnerabilities have been on display, so emotionally investing in their journey together is made much easier. So, at the very least, the premiere offers the series a wealth of potential and promise as it leads into the rest of its rookie season. When looking back at the season as a whole, 'It Begins' might not stand out as one of the series' brightest or most memorable entries, but it will have been essential to the show's success, if Love does end up attracting a significant and loyal audience for the streaming giant. And, based on what's been seen so far, it is a good bet the series will find that audience. Apatow's name in the credits will be appealing for many comedy fans initially, and while his imprint on the final product is quite evident, the relatable characters and the naturalistic performances from Jacobs and Rust will likely be what keeps viewers tuned in. For Apatow, Love appears to be less about himself, serving more as another potential career launching pad -- this time, for his series co-creators, Arfin and Rust. Those watching will just have to wait and see if they -- along with the show -- stick the landing. All 10 season 1 episodes of Love are currently available to stream on Netflix. Check Screen Rant this time next week for a review of all of season 1.